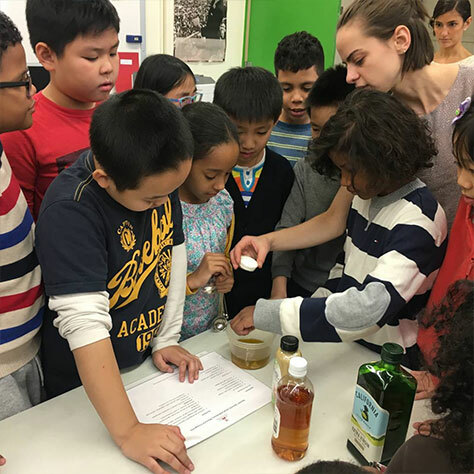 “Graduates” of our third grade program, Take a Taste with Spoons, continue their learning, exploration of food, and healthy eating in Spoons Recipe Days: a year-long program for 4th graders. Each monthly session of Spoons Recipe Days focuses upon a selected theme and recipe that encourages children to explore, prepare and taste healthy foods. Discover and explore the elements of taste and are encouraged to use descriptive words in discussing their observations. Taste the individual ingredients in a selected recipe and use their increasingly complex vocabulary to share their reactions. Learn about the nutritious aspects of the ingredients and any local, seasonal and cultural elements of the dish. Prepare and eat the recipe together learning food preparation skills to gain confidence in the that will enable them to participate in mealtime preparation at home. After each session, children are write and/or draw a reflection in their journals and are given a family newsletter with activities, suggestions for further reading, and a copy of the highlighted monthly recipe. Lessons connect to classroom curricular goals, including STEM, and COMMON CORE Learning Standards. Are you a New York City school interested in our programs? Click here to provide your information and we will send you an application for next year when it becomes available. If this program sounds like the right fit for your kids, we can help you!